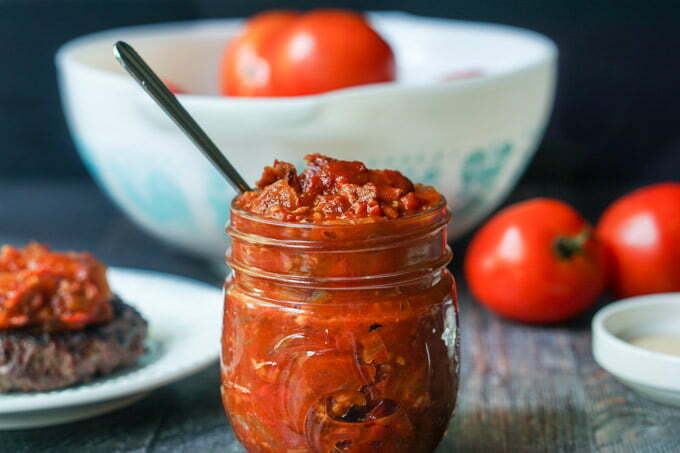 This low carb tomato jam is packed with flavor from the caramelized onions to the bacon to the sweetness of the tomatoes. Perfect on burgers, chicken or fish. Only 3.1g net carbs for 2 tablespoons! Looking to use up fresh garden tomatoes? Try this roasted tomato sauce or curried chicken salad stuffed tomatoes! I’ve never had tomato jam but it always sounded very tasty. Now that I’m faced with a mountain of tomatoes I tried to find more and more ways of eating them. I’ve also been craving caramelized onions for some reason. 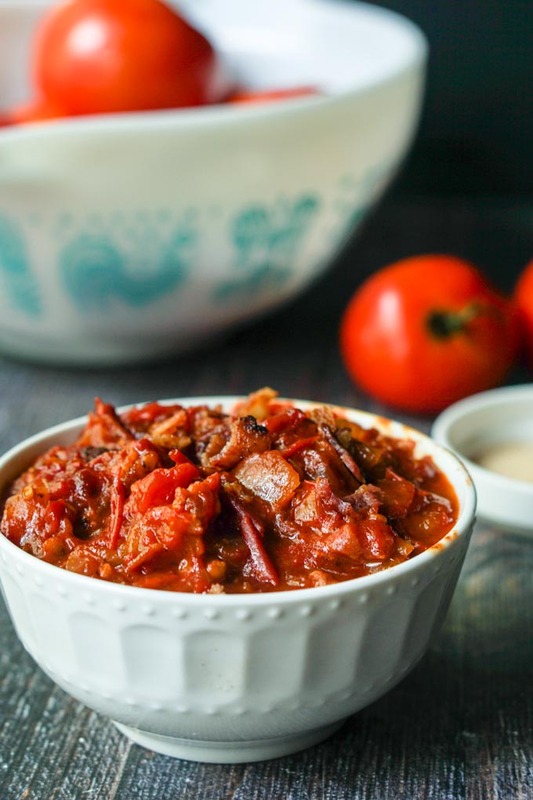 Yes, I know that’s strange but the I’ve been wanting to put them in everything so I thought it might be good in this low carb tomato jam and while I’m at it, may as well add some bacon! Everything’s better with bacon right?! Best of all this is low carb when used in moderation; only 3.1g net carbs for 2 tablespoons! 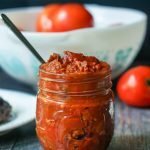 What ingredients are in low carb tomato jam? Well of course I am using fresh tomatoes. 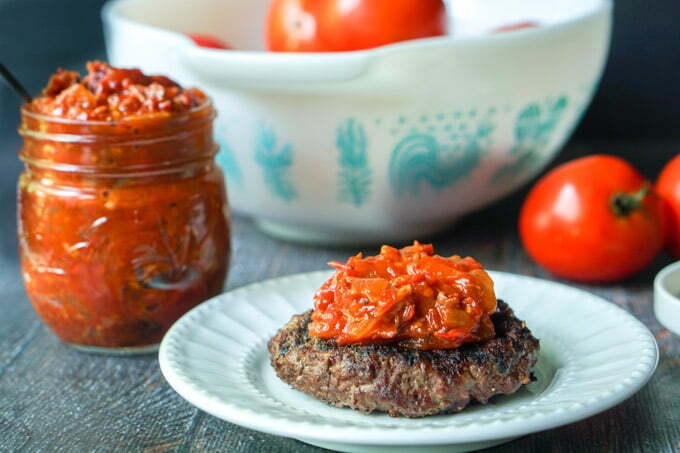 This is definitely a good summer recipe to use fresh garden tomatoes. 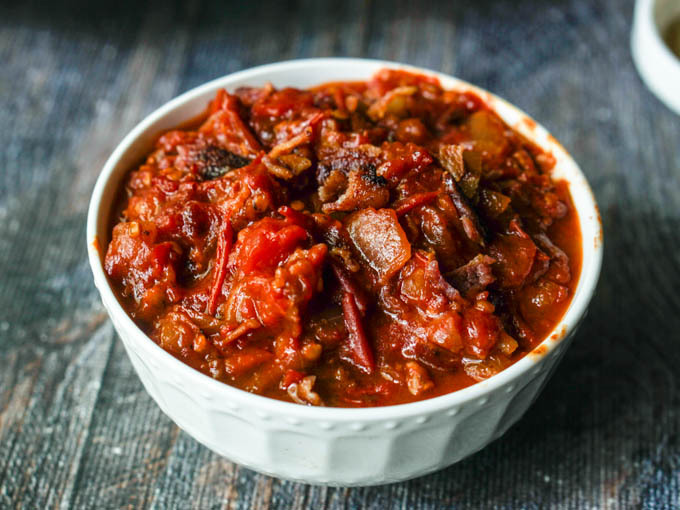 You could use tomatoes from the store but don’t use canned. I also used bacon, onions and Lakanto golden monk fruit sweetener. It’s has a bit of brown sugar taste and 0 carbs. If you don’t care about carbs use brown sugar or coconut sugar. That is all there is in this quick and easy jam recipe. Because there are only 4 ingredients I made sure to get double duty with the bacon. I fried in the pan and when it was cooked I took it out but used the grease to caramelize the onions. Once they are cooked and browned, I added in the tomatoes and sweetener and let it simmer for 10 – 15 minutes. You know it’s done when it gets rich and thick like a chutney or jam. What can I use this with? If you are trying to keep your carbs down, try this on a burger, chicken or even a milk fish. It will add so much flavor in just a spoonful. If you are not watching carbs, this would be good on sandwiches or with a big piece of crusty bread and melty cheese. Make a bruschetta type appetizer with it or even on savory French toast. How much does this jam recipe make? Depending on the type of tomato you use and how much water is in them, you will get approximately 1 cup of jam. And since there are 16 tablespoons in a cup, you can get at least 8 good servings out of this recipe. It’s also very easy to double or triple if you like it. Cook your bacon in a skillet. When done, take out the bacon to cool and put the onions in the skillet with the bacon grease. Cook the onions until caramelized about 10-15 minutes. In the meantime chop up your bacon and set aside. 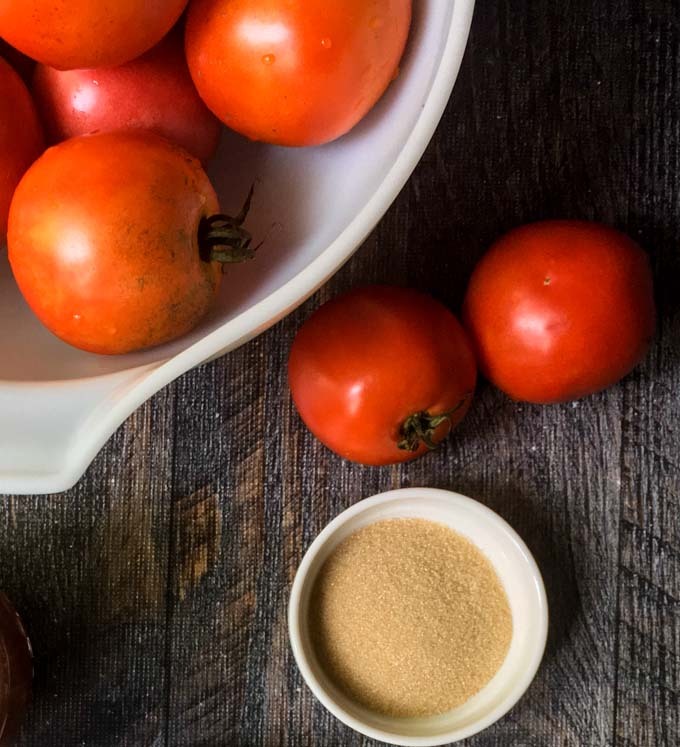 Chop up your tomatoes and sprinkle with salt and pepper and let sit. 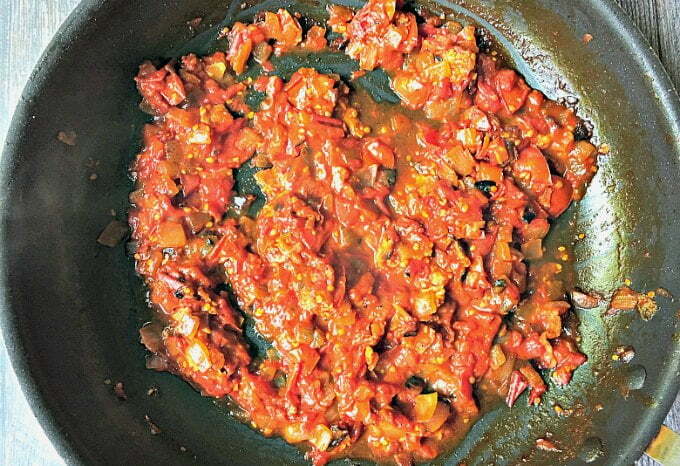 Once the onions are done, add in your tomatoes, sweetener and bacon and cook down until most of the water has evaporated and the becomes a jam like consistency. About 10-15 minutes. Serve over burger, chicken or fish. Store in the refrigerator. NOTE: You can use any sweetener you with. I suggest something with a brown sugar flavor but you can use Swerve, Splenda or something like that. If you don't care about the carbs, try coconut sugar or brown sugar. Previous Post: « Low Carb Smoked Burnt Ends – Perfect for Dinner or as an Appetizer! I want to make a lobster carbonara for guests and I am wondering what you think about using a dollop of your tomato bacon jam on top? Hi Nancy, I’m not sure how that would taste. The lobster carbonara sounds wonderful itself! If it helps at all the jam tastes very tomatoey with sweetness and a bit smoky from the bacon. Good luck! Why can’t I pin your recipes? I have already subscribed to your Newsletter? I don’t know why it’s not working. There should be little buttons along the side when you are on a desktop or along the top when on a mobile phone that have the Pinterest button. I’ve just added a little Pinterest button on the graphics so hopefully that will work too. Lastly here is my Pinterest page. Hopefully one of these solutions will work for you. Sorry for the inconvenience. And thanks for signing up for my newsletter. I just made this! So yummy and quick! Thanks for sharing! So glad you liked it! I eat it on everything. Thanks for taking the time to comment. Thanks Emily! I’ll be there! Thank you for linking up to this week’s Tasty Tuesday linky. I have pinned your recipe to the Creative K Tasty Tuesday Pinterest board. I hope you’ll join us again this coming week. Welcome to Yum Goggle! We’ve followed you on all your social media and hope that you will do the same! We will tag you as we can when we promote your post across the 14 platforms available to us! Kelli at YG. These are all my favourite flavours! Thanks Julie! Hope you get a chance to try it.